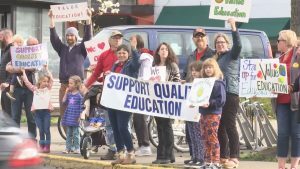 ASHLAND, Ore. – Teachers and supporters gathered in Ashland to bring their concerns to the community about the proposed state budget Friday. The Ashland Education Association worries the legislature, which is currently in session, isn’t doing enough to support teachers, prevent layoffs and keep class sizes small. One teacher says cuts will continue to erode educational opportunities for kids. Senate president, Peter Courtney issued a statement this week saying he was pleased with the investments proposed by the joint committee on student success.